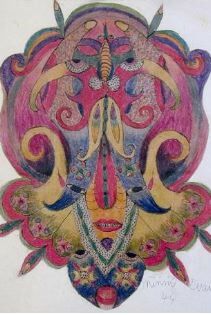 Minnie Evans began drawing at age forty-three, as an outlet for the religious visions she had been receiving day and night since childhood. She was a poor, black, untrained artist, who said “I am without a teacher, a wordly teacher... God has sent me teachers, the angel that stands by me and directs me what to do.” She felt that drawing and painting relieved the stress her dreams caused her. She believed the dreams were given to her by God and were remnants “from different nations” that had been destroyed before the Great Flood. Her pastor supported her beliefs, saying her dreams were all part of God’s Plan. Her strong religious faith provided her with the power to pursue the expression of her visions. From the 1940’s through the 1980’s, Evans created a body of work which included a series of 144 postcard-sized drawings, which she carried around with her at all times.